The Titanium is a combi gas boiler. It is a condensing wall mounted unit made and manufactured by Potterton. 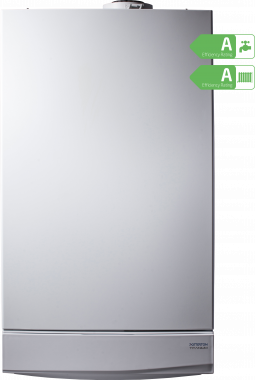 This unit comes with a wide range of features and options to make it an extremely reliable boiler, such as an efficiency rating of 91.1% making it an A rated boiler. It has an output of 33kW and is an extremely powerful boiler, with the Titanium coming with a range of output options such as the 24kW, 28kW, 33kW and 40kW, making this unit able to fit any sized home! This unit delivers instant hot water and heating on demand, and is known to be a family favourite boiler. This unit features a 24 hour mechanical clock and filling loop as standard helping the unit to be an easy to install product. It also comes with a flueing option of up to 20 metres making it perfect in where it can be placed with it being flexible and able to sit just about anywhere. The Titanium is Energy Saving Trust endorsed and meets the strictest product and energy performance criteria helping to save you money on your energy bills. This unit also comes with a seven year warranty providing you peace of mind that you have bought a reliable boiler!